"We are investigating one of the most fundamental questions in cancer biology," says lead researcher, Haiwei Song from the A*STAR Institute of Molecular and Cell Biology. The team has been studying the molecular mechanisms that underpin a genetic malfunction found in up to 95 per cent of human cancers. Their findings could lead to new treatments. Together with colleagues in France, the team has examined processes that activate the gene coding for a protein known as "the immortalizing enzyme." The dramatic name recognizes the enzyme's ability to allow cancer cells to survive and multiply, in defiance of normal controls on cell growth. But the reactivation of the gene for TERT in cells where it should normally be shut down is one of the central processes that allows cancer cells to multiply into life-threatening tumors. This undesirable reactivation can be caused by mutations in regions of DNA that control the activity of TERT's gene, which enable a complex of two regulatory proteins to bind to the mutated DNA and switch on the TERT gene activity. "This was a surprise," says Song, especially as it may mean that many other genes could potentially be activated in a similar way. "We plan to use our understanding of this system to make new drugs," says Song. 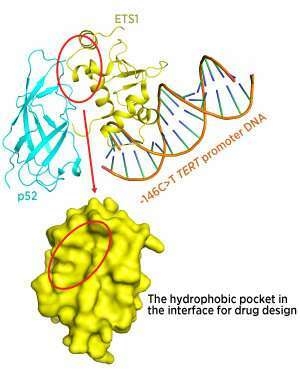 He explains that one option is to find small molecules that inhibit the reactivation of the TERT gene, for example, by binding to the proteins or the DNA involved. Liver cancer may be the first target, as this often involves mutations in the TERT gene that take effect in the early stages of tumor development.